Director – Richard Fleischer, Musical Sequences Directed by Herbert Ross, Screenplay/Music/Lyrics – Leslie Bricusse, Based on the Books by Hugh Lofting, Producer – Arthur P. Jacobs, Photography – Robert Surtees, Special Effects – L.B. Abbott & Art Cruickshank, Mechanical Effects – A.D. Flowers, Art Direction – Ed Graves & Jack Martin Smith. Production Company – Apjac/20th Century Fox. The village of Puddleby-on-the-Marsh, 1845. Young Tommy Stubbins meets the eccentric Dr John Dolittle, a GP who treats animals and can speak 849 of their languages. Dolittle liberates a seal from a circus and throws her into the sea so she can rejoin her husband, but is thought to be throwing a person in and is arrested. Placed on trial, Dolittle is committed to an asylum after he mentions in court about talking to animals. Tommy, the sailor Matthew Muggins and the animals rescue him and together they set sail in search of the mythical Great Pink Sea Snail. Hugh Lofting’s Dr Dolittle books are children’s classics. They were highly popular, all absurdist adventures set around the cheerful doctor who can speak animal languages. Hugh Lofting wrote eleven Dr Dolittle novels between 1920 and his death in 1947 (with a further three being published posthumously). There was purportedly a Dr Dolittle cartoon produced in Germany in 1922, although this is lost today. Disney tried to a number of years to negotiate the rights to the books from the Hugh Lofting estate but nobody had success until producer Arthur P. Jacobs, who would next go onto make Planet of the Apes (1968) and sequels, mounted this production with a then sizable $18 million budget. 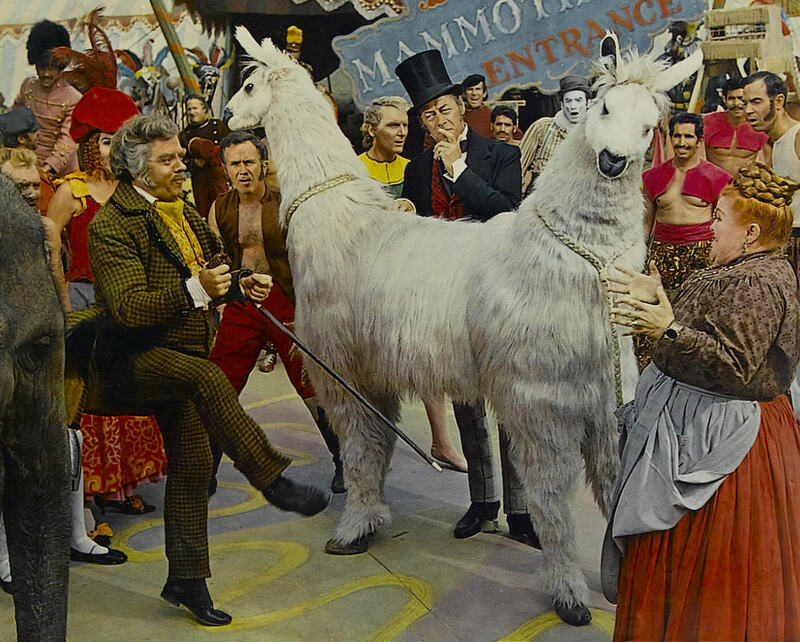 Doctor Dolittle was clearly made in an attempt to copy the success of Disney’s Mary Poppins (1964). It emulates the same nonsensical children’s musical adventure of Mary Poppins, not to mention is set in the same period Victorian era. Alas, while a reasonable success with audiences, the film was almost universally critically trashed. It was also a hugely problem-laden production, facing difficulty with the various animals and weather problems, even disgruntled members of the crew attempting to blow up the set. This, along with a massive promotional campaign to have the film nominated at the Academy Awards, caused the film’s budget to vastly overrun original projections. To everybody’s inexplicable surprise, it did receive a host of Academy Award nominations, including Best Sound, Best Musical Score, Best Cinematography, even being one of the five films nominated for that year’s Best Picture Award (although only won for Best Special Effects and Best Song). This was part of the era when The Sound of Music was a massive hit and various studios had gambled then enormous sums in the belief that the future of Hollywood was in musicals when in fact audiences were abandoning them in droves, creating a string of over-budgeted flops. 20th Century Fox nearly financially folded after the successive flops of musicals like Doctor Dolittle, Star! (1968) and Hello, Dolly (1969). The script plays mix and match with characters and happenings from several different Hugh Lofting books. Certainly, the film gets the essential nonsense absurdity of the books down well (much better than the terrible Eddie Murphy remake and any of it sequels). There is some appealingly silly scenes with Dolittle blowing bubbles to communicate with goldfish, creating eyeglasses for short-sighted horses, inventing tail-straightening machines for mice and the likes. Rex Harrison’s absent-minded, mannered social graces make for a wonderful deadpan presence at the centre of the film. However, director Richard Fleischer does not know the concept of levity and rather than dancing with sparkling wit, the film drags its feet with a leaden gracelessness. Many of the animal scenes are noisy slapstick chaos and the plot proceeds at a slow and ponderous pace – it is 90 minutes (the entire running length of the average film), for example, before we even get out to sea. The songs frequently go on interminably. By the end, after 152 minutes, nothing much has happened and it feels like it has taken an awfully long time to do so. Richard Fleischer was brought into direct because of his experience with big-budget effects driven vehicles such as Disney’s 20,000 Leagues Under the Sea (1954) and the previous year’s hit Fantastic Voyage (1966). While Fleischer was a great adventure film director, the musical is clearly not a form that suited him. He does okay with the effects – the Push-Me-Pull-You suit is clever. (After watching the film, the biology of such a creature led to some interesting speculations among friends about how such a creature might excrete). The Giant Pink Sea Snail looks flat, although there are some good effects with the whales pushing the land mass back to join the African continent. The film was remade as Dr Dolittle (1998), starring Eddie Murphy, which abandoned the period setting and nonsense adventure for inane and vulgar modern comedy routines. This was followed by a slightly better sequel Dr. Dolittle 2 (2001) and three further dvd-released sequels Dr. Dolittle 3 (2006), Dr Dolittle: Tail to the Chief (2008) and Dr Dolittle: Million Dollar Mutts (2009) without Murphy but featuring Kyla Pratt as his daughter. The only connection between these films and the Hugh Lofting stories is the name of the doctor and his ability to communicate with animals. Robert Downey Jr will play Dr Dolittle in a new version of the stories with the upcoming The Voyages of Doctor Dolittle (2020). Richard Fleischer’s other genre films are:– Disney’s classic Jules Verne adaptation 20,000 Leagues Under the Sea (1954), Fantastic Voyage (1966) about a miniaturized submarine journey inside the human body, The Boston Strangler (1968), the psycho-thriller See No Evil/Blind Terror (1971), the true life serial killer film 10 Rillington Place (1971), the over-populated future film Soylent Green (1973), Amityville 3-D (1983), and the Robert E. Howard adaptations Conan the Destroyer (1984) and Red Sonja (1985).